Providing you the best range of storage tanks and stainless steel storage tanks with effective & timely delivery. We are instrumental in manufacturing a customized range of Storage Tanks, which is extensively used in industrial applications. Our range is manufactured using quality material, with high end technology. Clients extensively use our range for industrial purposes. Our expertise lies in handling turnkey projects on the basis of single point responsibility. Clients can avail from us, a range of Stainless Steel Storage Tanks, which is manufactured in sync with the latest technology and industrial standards. Only superior quality stainless steel and mild steel is used by us to manufacture these storage tanks. Our range is appreciated for features like sturdy construction, durability and corrosion- resistance. 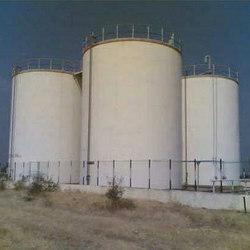 It is extensively used for chemical storage, diesel storage, Milk storage and other purposes. We can provide with an optional drive system as per the clients’ requirements.